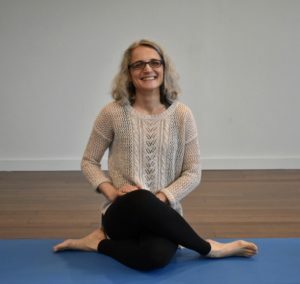 We are excited to welcome longtime student and graduate of Breathe’s 200 hour teacher training Anna Mirkova to our teaching staff at Breathe! How did you start practicing yoga? What was your early yoga experience like? I started practicing yoga at an extremely stressful point in my life a few years ago. I looked, unconsciously, for a way to calm my mind so that my body could start releasing some of the pent up tension that my muscles had been carrying for years. My early yoga experience was very challenging because the more tension I felt I was releasing, the more tension I discovered to release. At the same time this was rewarding because I started feeling that I had innate power to shape myself and not be shaped by stress. When did you get a sense that yoga was different, not just a way to be physical? I had a sense almost from the beginning that yoga was more than being physical. But when I started taking yin classes, I realized more deeply how much the body and the mind really shape each other. When I committed to practicing on a regular basis, I opened myself to the psychologically transformative qualities of the physical practice as well as the ethical and spiritual precepts of yoga. What is your favorite yoga pose and what is your least favorite yoga pose? And why? At this point in my yoga journey I embrace the challenges that triangle pose offers me: daring my hamstrings, forcing me to feel the alignment of my hips, tuning me in to the arches of my feet. Yet, if I let my mind obsess about these elements of my body, I miss the energy of the pose. So I’m using triangle to help me tap into my innate sense of balance. In what way does your yoga practice most impact your daily life? It helps me be aware of my breath, which in turn helps me recognize when I need to slow down and how I need to be with myself when I transition from task to task. My regular yoga practice helps me cultivate resilience. This month at Breathe we are focusing on the fourth yama, brahmacharya, which in addition to fidelity and control of sexual energy, also represents a virtuous lifestyle that includes simple living, meditation and mindfulness in word, thought, and deed not to be driven by sensual pleasures. How do you experience/practice brahmacharya on your yoga mat, in your teaching, and in daily life? Before I leave home every day for work, I sit down – as I am dressed for work – for 5 minutes just to breathe so that I can start the day with a clearer mind and be receptive to what the day brings. What is a fun fact about you that not many people know? I enjoy making whole grain and rye breads as well as all sorts of flat breads from dried legume flours. Tell us something about teaching at Breathe. Breathe is such a special community of inspiring and supportive people. I love teaching flow basics at Breathe because it gives me the opportunity to guide the practice of such a great variety of yogis. I am humbled by this privilege and thrilled that it helps me grow as a yoga teacher and student.